Fabulous house in a great position with numerous bedrooms although the kitchen was in the wrong place and did not take advantage of the beautiful outlook over middle harbour. The clients wanted the kitchen to be in the centre to allow integration from the back to the front of the house and easy flow. 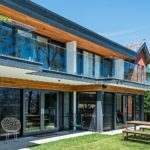 As they would be renting whilst the renovation took place they were looking for a quick build time, they wanted a safe and solid building as the location meant they are exposed to the elements and that blended perfectly with the existing home whilst having as little impact as possible on the environment. Hebel solid panels pre-cut off site and craned into position.